Mr Zip … What a career he enjoyed. More coverage than the American Idol, which, likely, he was for generations of children. 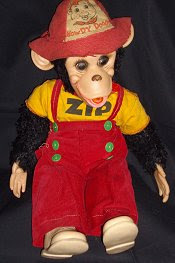 So you remember the Zip doll and Zippy the chimp on Howdy Doody? I didn’t watch Howdy-Doody, it must not have been on my local stations. Nice walk down nostalgia lane. Thanks. You’re welcome, Mark. I recall watching Howdy Doody reruns once or twice, but I guess it wasn’t my thing. I favored cartoons. You have put much thought into this project. LOL – you have no idea! A writer’s work is never done… mostly because we keep coming up with new projects for ourselves. Anything makes a great story. 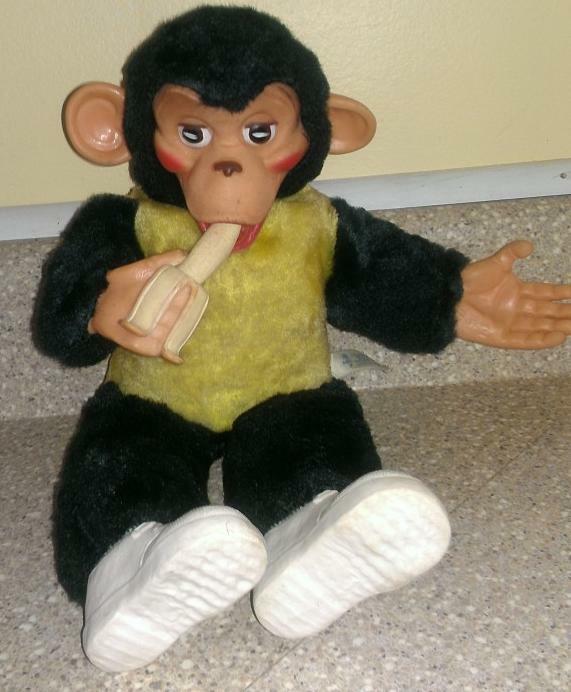 I have this same monkey. I am, by the way, 54 years old. My uncle Dause searched for him one year for Christmas. You see, when I was very small, I had another one that was a little different. I got him after breaking my arm at less than 2 years of age. He got lost but I had named him Dausey monkey. After he got lost, my Uncle Dause searched all over and found one like you have pictured above. My uncle died when I was 5 years old of emphysema and is still a very vivid part of my memories. He had taken care of me when I was small and was a major part of my life for those 5 years. My Dausey monkey is a bit more ragged, you see, I helped him chew off the end of his banana and his ear has been bitten and fur us a little ragged. He is still very treasured! I so wish I could have included a picture of him. I am quite sad, as I was looking for the Mr Monkey model to replace my sisters. She named hers Suzi. She still has her, but no ears feet or banana, and the fur is so wore it could be called a burr. She is still loved and I wanted to get her another as my sister is a cancer survivor and now does CrossFit. Next week she is having rotator cup surgery/ Where is the American manufacturers when you need them. That’s right they went south or west. Kudos to your sister for beating the challenge of cancer!